Be the first to share your favorite memory, photo or story of William . This memorial page is dedicated for family, friends and future generations to celebrate the life of their loved one. 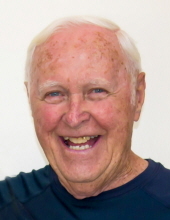 William (Bill) Thomas Gorbett, 86, passed away on Tuesday, April 9, 2019 in New Braunfels, Texas. He was born on April 21, 1932 in Cleveland, Ohio to Robert Roy Gorbett and Mary Veronica Murray Gorbett. Bill graduated from Cathedral Latin High School in Cleveland, Ohio and from Miami University in Oxford, Ohio where he was a member of Beta Theta Pi Fraternity. He served in the Army during the Korean War. He married Carol Cavanaugh, his college sweetheart, and they raised three daughters (his Allstars). He lived in Japan, Illinois, Ohio, New York, North Carolina, Florida, and Texas. For most of his career, Bill worked in the trucking industry in labor relations and he was the guy you wanted at the negotiation table. Bill was an avid golfer and everyone wanted to be part of his foursome. While never scoring the elusive hole-in-one, there were many times he “pert’ near canned it.” As a proud Irish Catholic, his faith in “The Big Guy” was second to none. He believed family was everything. The twinkle in his beautiful blue eyes, his big smile and warm hugs made everyone feel like family. He enjoyed the heck out of life and made sure everyone around him did too. There will never be another Bill Gorbett. Bill was preceded by his wife of 37 years, Carol Gorbett. He is survived by his girlfriend, Judith Fontenot; children, Cathleen Gorbett, Lyn Litchke (Scott), Ann Gorbett-Barrera (Polo); grandchildren, Nicholas Sansavera, Zachary (Xander) Saunders, Samantha and Jared Litchke, and Marissa and Ariana Barrera. A funeral Mass will be held at 10:00 AM on Tuesday, April 16, 2019 at Sts. Peter and Paul Catholic Church. A procession will follow from the church to Lux Funeral Home Chapel. Calling hours will be held from 11:30 AM to 2:00 PM at the chapel. Burial will take place in Tallahassee, Florida. Donations can be made to Sts. Peter and Paul Catholic Church, The Salvation Army, and Guide Dogs of Texas. To send flowers or a remembrance gift to the family of William Gorbett, please visit our Tribute Store. "Email Address" would like to share the life celebration of William Gorbett. Click on the "link" to go to share a favorite memory or leave a condolence message for the family.